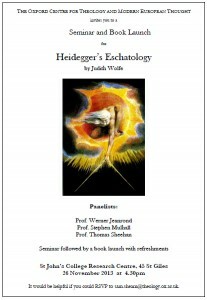 The Oxford Centre for Theology and Modern European Thought invites you to a Seminar and Book Launch for Heidegger’s Eschatology (Oxford University Press, 2013), by Judith Wolfe. It would be helpful if you could RSVP to sam.shearn@theology.ox.ac.uk. Download and distribute the flyer for this event here [PDF]. © 2013 CENTRE of THEOLOGY and PHILOSOPHY.